The Swiss class Re450 electric locomotives are a 115-strong fleet of four-axle single-ended machines built between 1989 and 1997, numbered (as per the Swiss convention) from 450 000 to 450 114. 27th May 1990 was a red letter day in north-central Switzerland, as it marked the opening of the Zürich S-Bahn operation. The Hirschengraben Tunnel, burrowing 1.3 miles beneath the city, serving the four new low-level platforms at Zürich HB (41 to 44) and surfacing at Stadelhofen, gave a brand new cross-city route, creating a network of suburban routes linked through a central belt that has continued to be developed over the last 28 years. The Re450s were initially referred to in the design and production stage as “Re 4/4V”, and the first batch of 24 locos (450 000 to 450 023) were intended to be delivered as 10500 to 10523, although the class designation was updated before this could happen. They were delivered in four batches (of 24, 26, 45 and 20 machines respectively) over eight years with minor detail differences between them. The above is a link to a video uploaded to YouTube by user Yves Mamin, showing a compilation of scenes of Re450s at work. The DPZ sets are of particular interest to the “new engine desperado” as, in peak times, the complete sets run in multiple in pairs or even threes, meaning that each two-minute leap in the tunnel beneath Zürich can theoretically net you three different locos! In actual fact, it is possible for four DPZ sets to work together, however they are limited by both platform lengths and in-cab displays to an operational maximum of three sets together. All 115 Re450s remain in service, however only 113 of them are on the duties that they were built for. Two of them – 450 067 and 450 070 – have been working for the Sihltal Zürich Uetliberg Bahn (SZU) since 2008, now reclassified and renumbered 456 551 and 456 552. They can now be found operating alongside the SZU’s six pre-existing Re456 locos on the S4 route from Zürich HB to Sihlwald. The SZU runs into underground terminus platforms 21 and 22 at Zürich HB, which are entirely separate from the other parts of the station. Interestingly these also opened in 1990, but had in fact been constructed for a stillborn U-Bahn network back in the early 1970s, lying dormant for two decades before the SZU was extended in from to Selnau to use them. Members of European Rail Gen can find the diagrams for these locomotives in the Files section of its website. (May I give you a polite nudge that if you use these diagrams, please do then post your sightings to the group afterwards). The oldest 450s are coming up for 30 years old, however they are not showing signs of being ready for withdrawal any time yet – in fact, they have recently been going through a comprehensive refurbishment programme at Yverdon works, which is intended to see them good for a further 20 years. 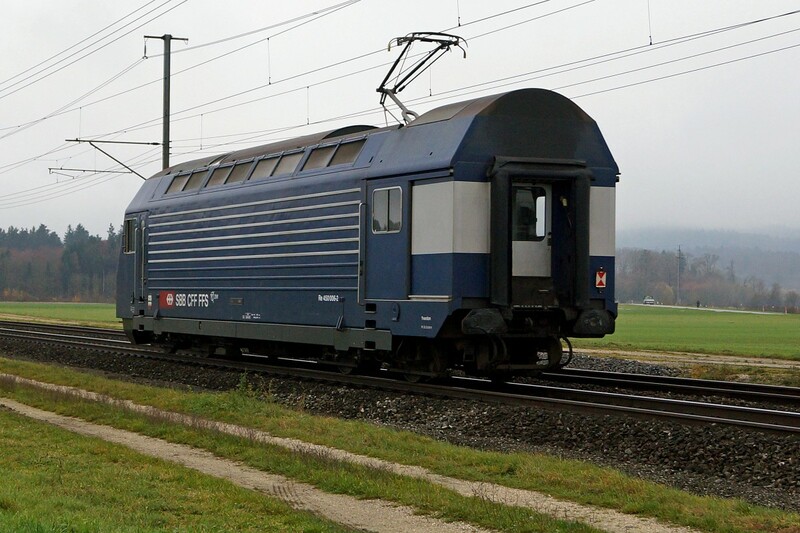 New low-floor carriages have been constructed to replace the intermediate vehicles in each DPZ set, and the released vehicles have been marshalled into new “LION” (“Lifting, Integration, Optimierung, Neugestaltung”) sets topped-and-tailed by Re420s. Switzerland’s largest city (but not its capital – the Swiss see themselves as a confederation of Cantons and tend not to name any one city as the capital, although the government has its home in Bern) is a wholly viable tourist destination (tourist website here). It is the country’s financial and economic centre and in 2010 was ranked as the 9th most powerful city in the world, despite only having 400,000 inhabitants, more or less the same as Bristol. In terms of weaving Re450s into non-railway holidays and trips to the city, this is made easy by the fact that the two main adjacent stations in the Hirschengraben Tunnel – the Hauptbahnhof (the nodal point of the entire Swiss railway network) and Stadelhofen – stand on opposite banks of the Limmat river and are both close to things worth seeing. The latter station is near to the bank of the Zürichsee (Lake Zürich) and also the opera house, and the Quaibrücke, bridging this river nearby, is particularly scenic. A note for visitors – Switzerland has four official languages (French, German, Italian and Romansch) however in Zürich the standard language is German. Zürich has an airport (ZRH) which is the main airport for the whole of Switzerland. UK-wise, it is currently possible to fly there from Birmingham, Edinburgh, London City, London Heathrow and Manchester. The airport is rail-served and the journey time from there to the Hauptbahnhof is only about 10-15 minutes.